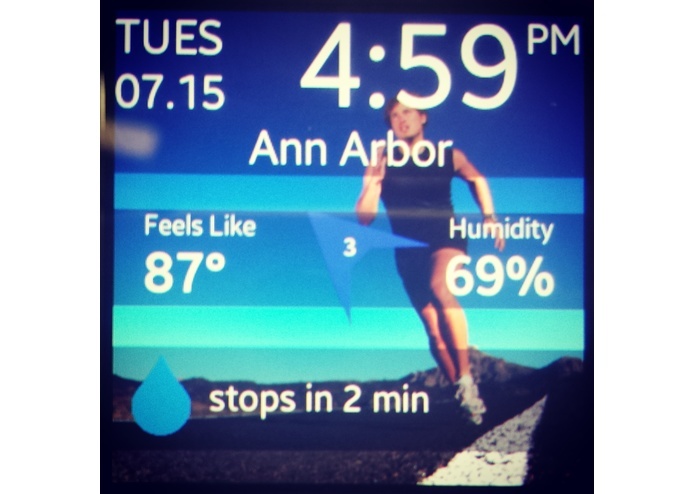 SPORT Weather is a watch face for the Gear 2 that provides the sports enthusiast with the weather information that is critical to their activities - mainly, will it rain and when? 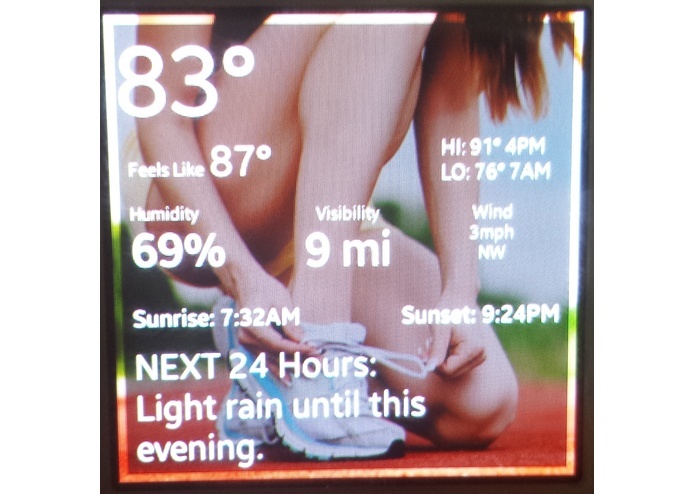 The most important weather info is displayed in the main screen alongside the clock - when will it start and stop raining, what is the "feels like" temperature, the wind speed, and the humidity. 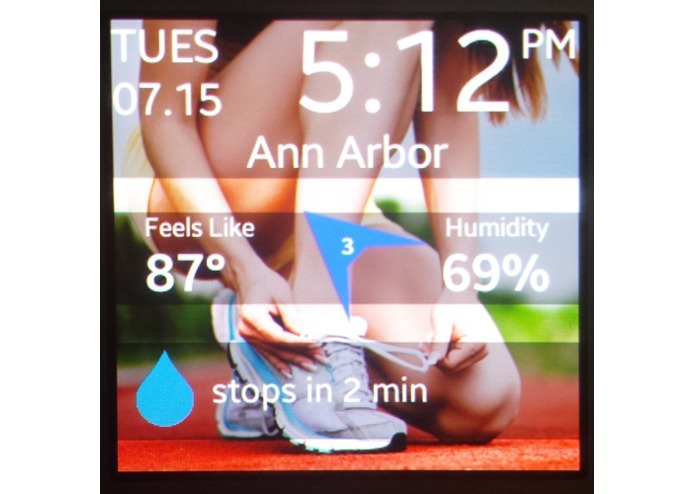 Please note: This Gear app is an integrated app. When you purchase it through the Samsung App Store, the app will be installed on your smart phone or device, and that app will install the watch app onto the watch within the next minute. But I have a weather app, why do I need this? Does your weather app tell you exactly when it is going to rain, down to the minute if you are within an hour? Doubtful. Does it have freakishly accurate data down to the minute like this app, or just general data about the entire day (that is often wrong anyway!). General, shmeneral! We need to know if it is going to rain right now, don't we! We deserve to know! If it is going to rain in eight minutes, this app will tell you, and then it will rain in exactly 8 minutes. It is that accurate! If it looks like it is going to start pouring rain, but this app says you still have 30 minutes. 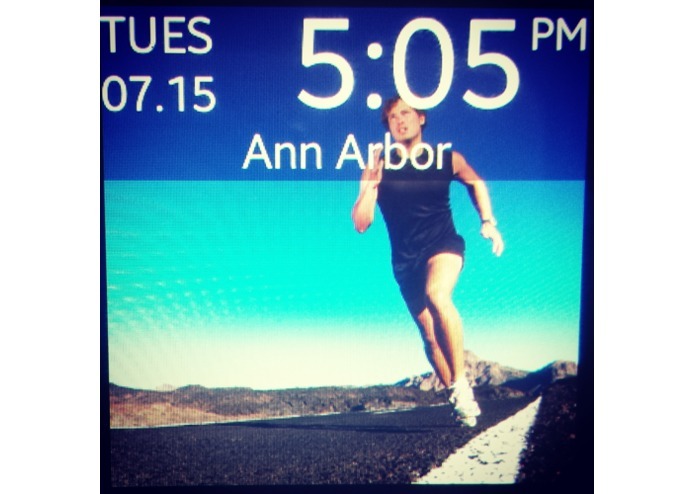 You still have 30 minutes, so get in that quick jog! Another Note - Within the next couple hours, this app is freakishly accurate. Go out six hours and it is still very accurate. As it gets further out, the forecast gets less accurate. We become more reliant on those weather folks at that point, rather than the super smart algorithm this app bases your forecast on. But for most SPORT enthusiasts, the next six hours are by far the most important. 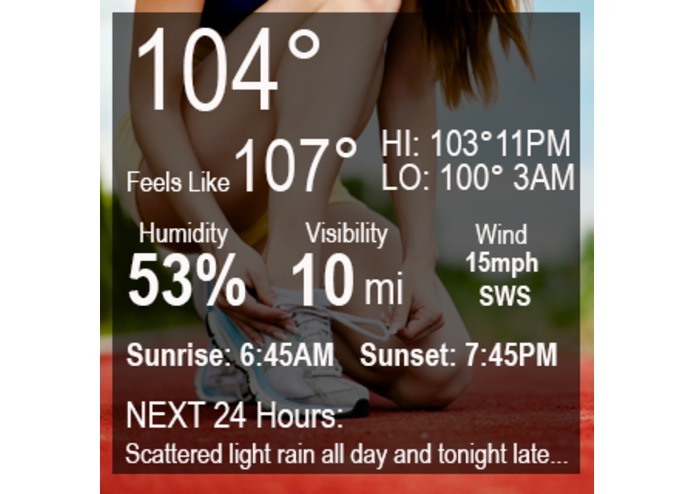 Hence the name, SPORT Weather! If you tap on the top section, it clears the other data off the screen giving you a cleaner interface. 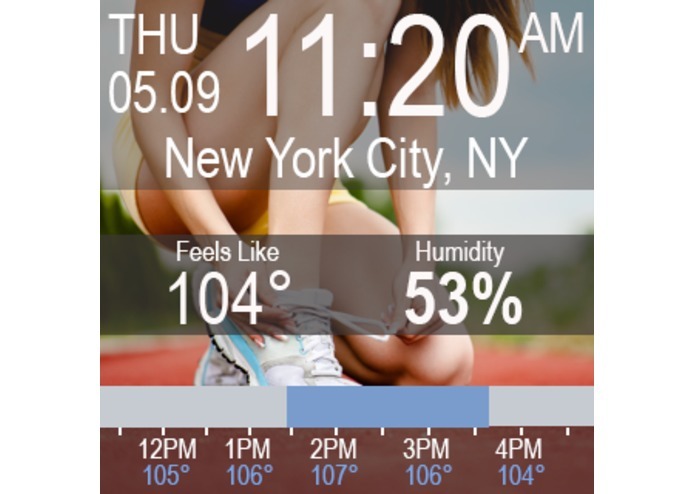 If you tap on the middle section, it opens to a larger display with a lot more weather information. Tap it again, and it goes back to the main screen. Bottom Area - When will it rain? The bottom area gives you the most important information to anyone planning an outdoor sporting activity - when will it rain next? If it is raining, it will tell you when it will stop! It is freakishly accurate, down to the minute, within the next 6 hours (the most important time to know when it is going to rain!). 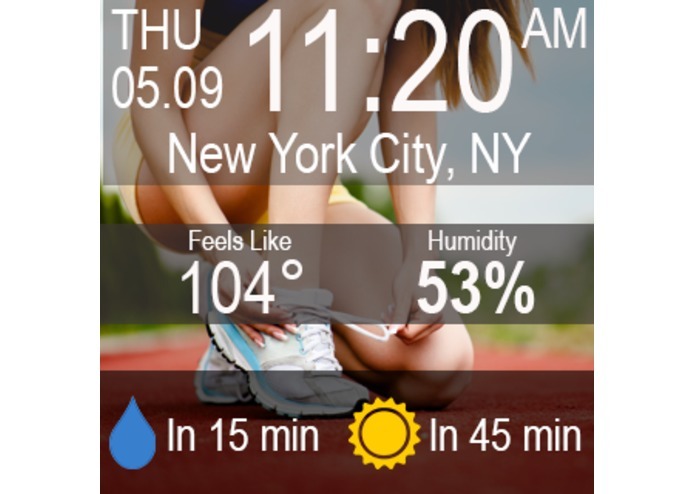 Tap on the bottom area, and it displays a time-based chart, telling you exactly when it will rain and the expected temperatures over the next 5-6 hours. 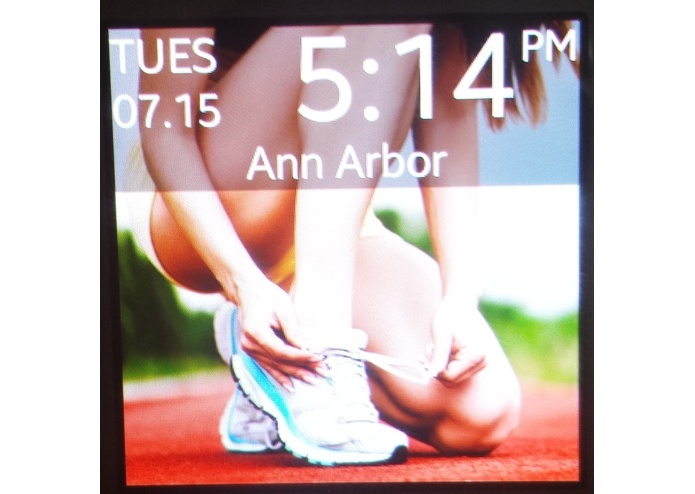 Use the companion Android App on your Samsung device to pick a background image for your watch screen (including various runner pictures and a transparent mode which shows through to what you have for your default watch background image). You can also set the daily time and length of the events, allowing the app to make sure that it gives you more up to date data during that time, even if you leave your phone behind for the activity!